THE Provincial Government of Pampanga has allotted P22 million for the rehabilitation and recovery program of 10,375 farmers who were affected by the typhoon and southwest monsoon last 2018. According to Governor Lilia “Nanay” Pineda, the Capitol is recognizing their efforts to produce rice for Kapampangans. May it be day or night, their intensive efforts to provide food for the province is so much to thank for, she said. “Dahil sa inyo kaya ang bawat pamilyang Kapampangan ay may nahahapag na pagkain sa kanilang mga tahanan. Ang Kapitolyo ay palaging naka-antabay sa inyo upang kayo ay tulungan sa inyong mga pangangailangan (It is because of you that each Kapampangan family has food on the table. The Capitol is always ready to assist you in your needs),” she said. 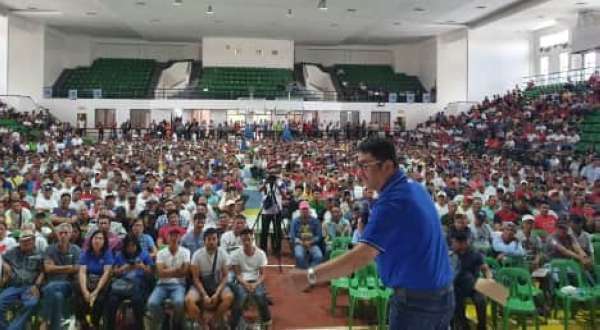 For his part, Vice Governor Dennis “Delta” Pineda assured the farmers that the provincial government would strengthen support for them and prioritize machineries, equipment and seed development for them. Meanwhile, Third District Board Member Anianas Canlas, Jr., chairman of the committee on agriculture and agrarian reform, lauded the farmers for being resilient, especially that today’s biggest competitor is climate change. The lady governor also invited Dr. Frisco Malabanan, senior technical promotion consultant, to discuss to the farmers the one-million hectare hybrid rice intensification project. Malabanan explained to the attendees the performance of paddies in the country from 2015-2018. In 2018, palay production decreased by 1.14 percent as compared to 2017. The area harvested for palay decreased from 4.81 million hectares to 4.80 million hectares from 2017 to 2018. Also, the recorded highest average yield was 4.01 metric tons per hectare last 2017. He also shared that Department of Agriculture Secretary Emmanuel Piñol is campaigning to address the fear and concerns of the rice industry on the Rice Tariffication Act in the Philippines. Governor Pineda also reiterated the advantages of tariffication for the agriculture industry. For Senate Committee on Agriculture and Food Chairperson Cynthia Villar, this would help local farmers to be more competitive. “Because in the recent lifting of quantity restriction, one of its impact is the lack of competitiveness in the market that would eventually discourage the farmer to produce rice,” she said. The law, according to her, provided for a competitive enhancement fund. The fund would allot half to rice farm machinery and equipment for eligible farmer groups, rice cooperatives and local government units, while 30 percent will go to rice seed development, propagation and promotion, and 10 percent each to rice credit assistance and rice extension services. This will also be a source of direct financial assistance to farmers cultivating two hectares and below in the form of compensation for projected losses. Third District Representative Aurelio “Dong” Gonzales, Jr. for his part, said that he will allot P80 million this year for the agricultural industry of the province. According to provincial agriculturist Edilberto Salenga, each farmer received P1,300 multiplied by the measure of hectares they owned.